The announcement that the central Bank of Jamaica is issuing notes of $5,000 denominations has correctly drawn debate. The question whether the new specie signals rampant inflation or portends large scale printing of money to address the budget shortfall was expected to ignite chatter in academic, economics and finance circles. And it did. What was unexpected was the “culture club” entering the fray with its own money icons: Bob Marley and Miss Lou (Louise Bennett). It was amazing. The critical issue of the reason/implication of introducing a $5,000 bill was sidetracked by what must be a triviality. Can Jamaica afford such a debate? And afford there has a double intent. But chatty chatty as we love to be, I said what the heck; this shows that democracy, if nothing else, is healthy in Jamaica. (Well, sort of, because the money was already printed when the Marley and Lou chorus started to sing.) Abeng News Mag will join the chatter. We’ll take a very narrow focus and dismiss the suggestion of the alleged Bob Marley Fan Club as baloney. And you guessed it: baloney (pork product) and Rasta don’t mix. We’re not the Imam nor the Archimandrate to issue Rastafari doctrinal bulls; but think about it: where do Marley’s tenets and Jamaica’s fiscal policies intersect? Oh yeah. Bob Marley did find the the method of making money from music, not from ether as printing money without “backative” amounts to. Further, as a colleague of mine says, a $5,000 note with the likeness of Robert Nesta would be an immediate worldwide collectors’ item, even for non-numismatists. Jamaica would have a new industry printing $5,000 (at let’s guess US 50 cents each) worth US$50 that would sell for US$100 a pop. The economic crisis would fly away over night. The reality is though, that while seemingly revolutionary, placing Marley’s likeness on Jamaican currency would be a two-faced sham. It’s not a coincidence that while Marley, Peter Tosh and Bunny Wailer Livingston were preparing to bury the pound in 1967-68, with Pound Get a Blow and Walter Rodney was grounding with the Wailer’s brethren, Hugh Lawson Shearer was preparing Rodney’s deportation papers and banning books that promoted black liberation in Jamaica and Africa. Yes, Edward Seaga and the Jamaica Labour Party had Marcus Garvey’s body exhumed in England and reburied in George VI Memorial (later National Heroes’) Park in 1964 or thereabouts; then in 1965, to mark the centenary of the Morant Bay Rebellion, they deposited some bones in the park and built monuments to Paul Bogle and George William Gordon. All three original national heroes, and especially Marcus Garvey, promoted radical action for the upliftment of the mass of Jamaican poor and rather than their ideas of freedom and empowerment being embraced as the sinew and flesh of Jamaican culture and society, they are treated as relics suspended in museum amber. They don’t score much grade on the Caribbean Examinations Council’s school leaving exams. Some smarty pants sociologist, or psychologist or zoologist is going to contradict this and say “but doesn’t this represent the integration that this country so badly needs to prevent the stratification and division that has got us to this sorry place?” To them I say, should Barack Obama show inclusiveness by issuing a Karl Marx imprinted $200 bill? Or Fidel Castro issue a Fulgencio Batista $100 peso? Will priests feel comfortable pocketing money from their congregants offering up on the collection plate bills with the likeness of a man who unapologetically sang, “I feel like bombing a church/Now that you know that the preacher is lying”. Maybe that’s an unfair question. And now to Hugh Shearer. For years he worked as an understudy to Alexander Bustamante in the Bustamante Industrial Trade Union and in the JLP. He was the dark skinned cousin of the Clarke/Manley clan who gave us Busta and Norman Manley and Michael Manley – formidable founding fathers and son. Shearer got his turn as prime minister when Donald Sangster took ill and died a few weeks after winning the 1967 general election. He inherited a five-year-old country that had been led by a man going blind in a wheel chair as it groped to find its identity and establish its roots in the soil of a hostile world economy during the height of the Cold War. It was a period of high expectations with local capitalists wanting a greater share in the “Jamaicanized” economy, and the masses ditching the old mento parodies staking their claims to a new identity and a piece of the economic action in their rock steady and reggae, flexing their muscles in a string of industrial actions. Despite the environment, Shearer presided over a growth economy, switching smoothly from pounds to dollars and cents while as a unionists turned PM he withstood the greatest onslaught of labour since the 1938 uprisings, as the country prepared for the 1972 election against a People’s National Party led by the stinging and debonair Michael Manley. By the 1976 general election, Shearer had been deposed by Seaga and took on the role of Jamaican elder statesman at a relatively young age. While there were rumours about bad treatment by his party, he remained loyal to the JLP – surviving a spear gun attack by an opposing mob in Trelawny during campaigning, without the recriminations so common among JLP and PNP colleagues – and to his country. He served as Deputy Prime Minister and Minister of Foreign Affairs, 1980-1989. He died on July 4, 2004. That the government has simultaneously unveiled a monument to him in National Heroes Park, Monday, May 18, on what would have been Shearer’s 86th birthday and soft launched the $5,000 bill, is testament to his contributions that included the initiative he mounted in 1963 to have the United Nations declare 1968 as the International Year for Human Rights. Ironically that was the year he denied University of the West Indies’ students the right to demonstrate and sent home Rodney and others. As Dr Peter E.T. Edwards of the University of Delaware wrote I a letter to the Gleaner, “Placing the image of a well-known anti-oppression, anti-Establishment Rastafarian ambassador and cultural icon such as Robert Nesta Marley on money would, in my opinion, represent that he is now part of the Babylon system. The very system that he fought against through his music. Marley isn’t a national hero nor an ex-PM, so until the country is willing to embrace him as little more than an extremely popular minstrel with cutting edge lyrics, allow Hugh Lawson Shearer his moment in the Jamaican limelight his party so denied him in his lifetime, notwithstanding the high offices confered on him. Our recommendation for the $10,000 bill, Brer Anancy, the hero of trans-Atlantic survival and cunning but there is no question about whose face is on the $5,000 note. I love your piece Mark. Although I opened a “Pandora’s Box” on Jamlink, it is a long time I wanted to say what I said. This presented the opportunity for me. Great persons but in what context. Great article Mark. Forgive me if I do not trust anything this government says about issuing the Shearer $5K note. I believe that due to their cowardly retreat in plugging the revenue gap, they have resorted to the age old trick of printing un-backed currency as was done by previous JLP administrations. It would be very interesting if they fail to issue a Seaga $10K bill when his time is up! I would suggest a Bolt $10K bill now that he has broken the 150M world record and may well break the 400M record soon! Nice piece Mr. Mark Lee. It is the fiscal circumstances that warrant the issuing of this note that should be debated. Of course as a people we never miss an opportunity to debate fluff. Good job on this forum. I suspect that it is taxing on your physical, technological and financial resources. Facilitating broke pocket me in the woods to offer my two cents (which is probably overvalued by 200%). Keep it up as long as you can. Thanks for the encouragement Griffins, Richard, Oliver… It’s a tough job but as you point out, we need critical debate. Great article Mr. Lee!! Keep up the good work! Nuff respect!! Another great piece rich in historical facts, Mark — ever the writer, ever the historian. You certainly know how to keep a secret (from our little group). 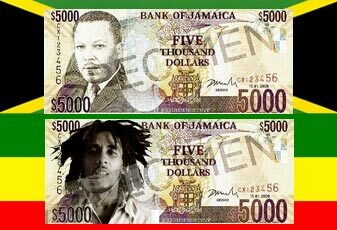 Has anyone asked Rita Marley her thoughts on folks wanting Bob’s image placed on a bill? Just curious.